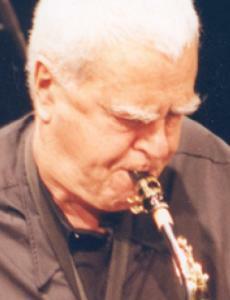 Charlie Mariano, the Boston-born saxophonist who gained world renown as a performer with his former wife, Toshiko Akiyoshi; Stan Kenton; and Charles Mingus, among many others, died yesterday at Mildred Scheel Hospiz in Cologne, Germany, his longtime home. Mr. Mariano, who had battled cancer for years, was 85. Born Carmine Ugo Mariano in 1923, he was weaned on his father’s beloved Italian operas and the big bands he heard on the radio: Benny Goodman, Duke Ellington, and Count Basie, whose saxophonist Lester Young became Mr. Mariano’s first musical hero. He would not get his own saxophone until his 18th birthday, but in short order, the ambitious young musician was playing nightly at Izzy Ort’s bar and dance hall in what was then known as Boston’s combat zone, for $19 a week. Mr. Mariano was drafted in 1943, but never saw combat. He was tapped to play in one of the several small music ensembles that entertained at officers’ clubs. Near the end of the war, Mr. Mariano, who was stationed on an air base north of Los Angeles, heard Charlie Parker play live for the first time, during Parker’s first West Coast gig, at Billy Berg’s jazz club in Hollywood. As it was for many alto saxophonists, Mr. Mariano found his muse and musical foundation in Parker’s ground-breaking sound. After leaving the Army in 1945, he drifted to Chicago, then Albuquerque, picking up work where he could, and finally wound up back in Boston. When the big-band era began winding down and many local clubs were closed, the largely self-taught Mr. Mariano enrolled in music school for the first time, at the Schillinger House of Music, which would later be renamed Berklee College of Music. Mr. Mariano started to develop his own sound under the tutelage of Joe Viola, and he became a fixture on Boston’s vibrant jazz scene, collaborating with Nat Pierce, Jaki Byard, and fellow students Herb Pomeroy and Quincy Jones. In 1950, Mr. Mariano released his first recording as a bandleader, and several years later founded the Jazz Workshop, a hands-on school that emphasized experience over instruction and later evolved into a popular nightclub. At the end of 1953, the financially strapped Mr. Mariano received a life-changing call from Stan Kenton, who tapped the saxophonist for his big band. After a couple of years on the road, Mr. Mariano settled in Southern California, where he joined drummer Shelly Manne’s band and worked as a session player. But he soon grew disenchanted with the hours spent behind the wheel of a car and the relentlessly “cool’’ jazz scene in L.A., and in 1958 Mr. Mariano accepted a teaching position at Berklee. He only lasted two terms before moving back west, accompanied by the young piano phenom Toshiko Akiyoshi. The pair married in 1959 and over the course of several years bounced from New York, where they formed the Toshiko Mariano Quartet and Mr. Mariano performed and recorded with Mingus, to Tokyo, back to New York, and then to Boston, where Mr. Mariano returned to teaching in the mid-1960s. Mr. Mariano also became known for his work on the nadaswaram, a South Indian woodwind instrument he discovered on an extended trip to Kuala Lumpur. After divorcing Ms. Akiyoshi in 1967, Mr. Mariano wandered the globe for years, commuting between the United States (he had yet another go teaching at Berklee) and Europe (where he eventually settled). Following the formation of Osmosis, his early jazz fusion group, Mr. Mariano devoted his last several decades to exploring musical amalgams inspired by other cultures, as well as by pop and rock. He was diagnosed in 1995 with advanced prostate cancer and given a year to live by his doctors, but with the help of alternative therapies and conventional treatment he lived another 14. Mr. Mariano leaves his wife, painter Dorothee Zippel Mariano of Cologne; his sister Connie Rosato; six daughters, Sherry of Salisbury, Cynthia and Melanie Lamar, both of Merrimac, Celeste Perrigo of Berwick, Maine, Monday Michiru of Long Island, N.Y., and Zana of Toronto, Canada; six grandchildren; and two great-grandchildren. Mr. Mariano is being cremated in Germany, and the ashes will be entombed at the family grave in Boston.